This excellent appetizer is similar to Spanish ceviche—raw fish and shellfish “cooked” in vinegar and lime juice, and seasoned with spices. The kalamansi lime juice, garlic, tomatoes and ginger give this dish a wonderfully fresh flavor. 1 Clean the fish fillets and cut them into strips. Marinate the fish in the vinegar for an hour, then drain and discard the marinade. 2 Add the kalamansi lime or lemon juice and all the other ingredients to the fish. Toss lightly to mix and coat well. 3 Transfer to a bowl and chill in the refrigerator until ready to eat. Garnish with onion slices and serve. 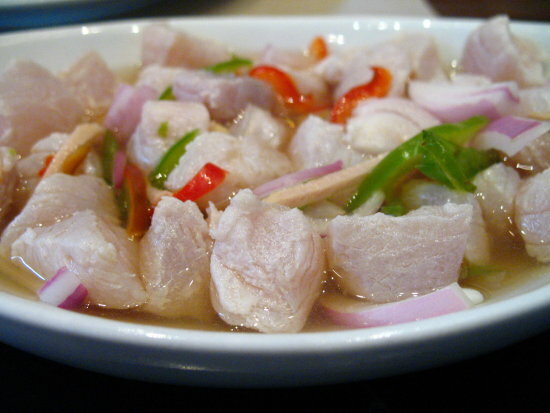 Your daily source of delicious pinoy food, easy to prepare recipe guides, promos, and a lot more.